Peter Row from EMQ centre, with (left) Alex Echeverria, Rescue Systems Business Development Director, Goodrich Sensors and Integrated Systems, and (right) Rob Gibbs, Value Stream Leader, Goodrich Sensors and Integrated Systems, California and France Operations. The Emergency Management Queensland Helicopter Rescue (EMQHR) service has received a major international award – Rescue of the Year – in recognition of its herculean relief efforts during January’s Queensland floods. 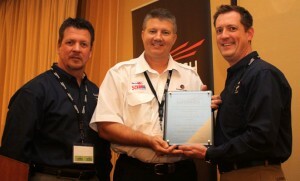 The award was accepted on behalf of EMQ by Brisbane-based pilot Peter Row during a helicopter rescue conference in Orlando, Florida. Row personally led ‘Rescue 510’ (flying a Bell 412 ) during EMS and search and rescue (SAR) operations in the flood-ravaged Lockyer Valley during January this year. “While we don’t do the job to receive awards, this recognition from our colleagues around the world makes us extremely proud of the job we do,” Row said. EMQHR personnel saved 43 people after flash flooding ripped through towns in the Lockyer Valley on January 10. Helicopter crews often had to contend with wild weather and extremely poor visibility over the entire week of rescue operations. 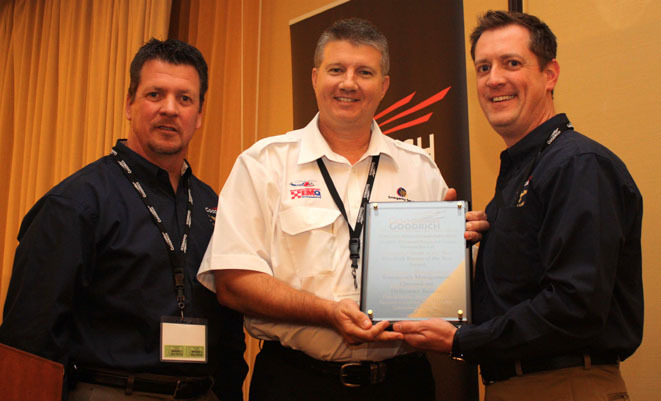 Emergency Services Minister Neil Roberts said the award was “a tribute to the professionalism and dedication of the crews and their willingness to go above and beyond to help their fellow Queenslanders in their time of need”. “Our pilots, crew and Queensland Ambulance Service paramedics are constantly training for days like the one they endured in the Lockyer Valley in January,” Roberts said. For full coverage of aviation’s role in the Queensland floods, read this month’s edition of Australian Aviation (March 2011).